Apple's special edition iPhone 8 and iPhone 8 Plus in red colour will be available for purchase in India from Friday. The special edition (PRODUCT) RED iPhone 8 and iPhone 8 Plus will be available in 64GB and 256GB variants, starting at Rs 67,940, through Apple authorised resellers. iPhone 8 (64 GB) will cost Rs 67,940 while 128 GB variant will be available for Rs 81,500. iPhone 8 Plus (64 GB) will cost Rs 77,560 while the 256 GB model will cost Rs 91,110. Earlier this month, Apple launched iPhone 8 and iPhone 8 Plus in red colour globally as part of its partnership with (PRODUCT) RED, an advocacy group dedicated to combating HIV/AIDS in Africa. Since partnering with (RED) in 2006, Apple has donated more than $160 million to the Global Fund, serving as the organisation's largest corporate donor. 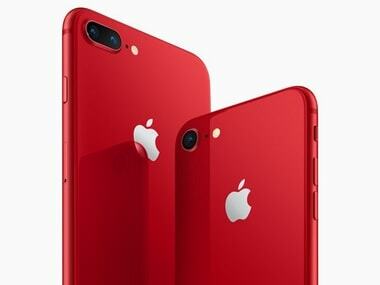 "This special edition (PRODUCT) RED iPhone features a stunning red and black colour combination and also offers customers the opportunity to make an impact in fighting the spread of HIV and AIDS," Greg Joswiak, Apple's Vice President of Product Marketing, earlier said in a statement.